?If you expect high quality, it may not suitable for you. The quality is proportional to price. We dare to guarantee the quality of our product is better than that of other sellers as we have made several improvement. The evening gowns for women formal is with heaps of trendy designs and flattering to curves. Pair it with heels to look more gracefully. ------3.Please feel free to contact us if you have any question. The new version of the evening gown dress was improved according to the reviews from our customers and made by the new measurement which was adjusted as the new size chart and description. All stock of this style has been changed since 15th NOV, please kindly check the new size chart again and make sure it will be fit for you. Attractive Design:The evening gown features with round neckline,flare sleeves,cut-in shoulders.sheer cape sweeps from shoulder to shoulder.Front slit to left thigh. Pullover Design. Material:The main body for the gowns dress is polyester and the sleeves are chiffon. 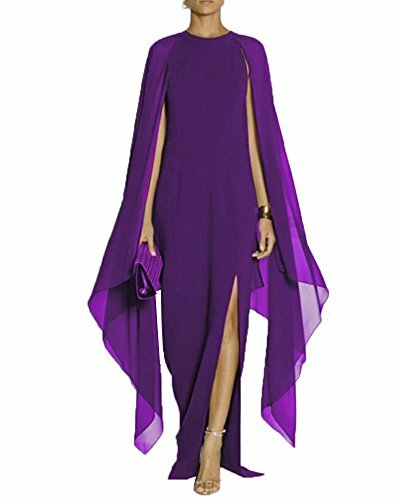 New SIZE measurement for evening gowns:----S: Bust: 35.43 Waist: 28.74 Hip:37.01 Length: 57.09 Sleeve:57.48----M: Bust: 37.80 Waist: 30.71 Hip:38.98 Length: 57.87 Sleeve:57.48----L: Bust: 39.76 Waist: 32.68 Hip:40.94 Length:58.66 Sleeve:57.48----XL:Bust: 43.70 Waist: 36.61 Hip:44.88 Length: 59.45 Sleeve:57.48----XXL:Bust: 47.64 Waist: 40.55 Hip:48.82 Length: 60.24 Sleeve:57.48 Applicable Occasions:Formal occastion,Celebrity,Party,Evening Party,Club,Night Out,Dinner,Birthday.